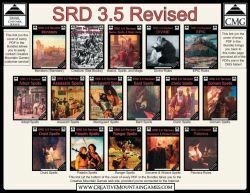 Just for the holiday, I am rolling back the price of the 3.5 SRD Revised to it's original price. When I first released it, it was just a couple PDFs covering the full SRD: Monster as well as Basics, Spells, and Magic items. These were heavily hyperlinked and bookmarked for easy use. This originally sold for $5 and quickly became a hot seller. Then, individual PDFs were added for the spells of each spellcasting class. A separate PDF for the Psionics rules was added, then one for the additional Divine rules and one for Epic rules. Pentultimately, a Creature Stat Blocks PDF was constructed taking all of the SRD monsters and laying them out in standard stat block format. Finally, an Index page was made that tied all of the other 16 PDFs together and each PDF in the bundle was linked back to the Index page. It's all amazingly fast for anyone needing a quick rules clarification or to check monster stats or spell details. The price has gone up over the years as more and more was added to the original product but it is on sale for the holiday for the original $5 price so grab one here.